The storied college football rivalry, dating back to 1927, between the Notre Dame Fighting Irish and Navy Midshipmen will begin a new chapter this Saturday. Navy have won two of the last three - an unimaginable feat a few years back. You have to go back to the Roger Staubach era to find their last victory before that. 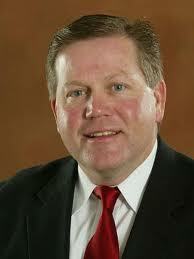 Coach BrianKelly (pictured) will be keenly aware of the Navy upset potential. Navy's triple option offense is almost a throwback to the time when there was no forward pass and it will cause huge headaches to the Irish. However, with Dayne Crist improving every week and Michael Floyd able to play Notre Dame should be able to pick apart a relatively weak secondary. The teams will meet for the first time at the new Meadowlands Stadium in East Rutherford, New Jersey. The Fighting Irish come into this contest with a major win last week over Western Michigan, 44-20, and a 4-3 record. Navy upsided the Southern Methodist Mustangs 28-21 bringing the Midshipmen’s record to 4-3. The game will be broadcasted live from Meadowlands Stadium in East Rutherford, New Jersey, Saturday October 23rd, at noon, nationally on CBS. QB Dayne Crist played an impressive game against the Broncos last Saturday. He led the Fighting Irish to victory with three touchdowns on 225 yards passing and added one of his own on the ground. Crist added to his lofty total of 18 TDs thus far this year. WR Michael Floyd had a very strong game with nine catches for 157 yards and three touchdowns. He has slowly entered the conversation of the best receivers in the nation with 624 yards and six touchdowns. Floyd was banged up against Western Michigan suffering a sprained hamstring and has been held out of practice for this week’s game. He wil play avoiding the fate of teammates TE Kyle Rudolph (Hamstring evulsion) and WR Theo Ruddick (ankle) in the Notre Dame Infirmary as those doubtful to play against Navy. The los sof Riddick and Rudolph serve as a major blow to the Fighting Irish spread offense this week but in addition to FLoyd it has steady receivers in TJ Jones (203 yards, 2 touchdowns this year) and TE Tyler Eifert. The running game Saturday was paced by Cierra Wood’s 94 yards and 1 TD. He will be a major factor against the Midshipmen as featured back, Armando Allen Jr., has been held out of practice with a hip flexor. Notre Dame’s D shut down Western Michigan last week allowing only 314 total yards (30 yards less than average) and only a field goal after halftime. They also forced 4 turnovers and recorded 4 sacks. The defense is coming up big for the Irish this year by recording 14 takeaways (10 INTs) and 19 sacks. DE Ethan Johnson notched 1.5 sacks last game and a crucial fumble recovery against WMU and ILB Manti Te'O recorded ten tackles upping his total to 76. The Midshipmen have some big guns in their Option attack that’s averaging 259.9 rushing this season. This offensive is commandeered by the versatile Navy QB Ricky Dobbs. Last week Dobbs threw for 84 yards and a score and ran for 62 more. On the year Dobbs has rushed for 379 yards and 5 scores. FB Alexander Teich ran for a pair of TDs and 95 yards against MSU. SB Gee Gee Greene has added 274 yards this season to the ground attack and also leads the team in receptions with 14. In holding the Mustangs to 21 points the midshipmen forced three turnovers. On the flipside, the Navy secondary gave up 245 passing yards, surpassing its average of 149 a game. The defense is led by OLB Aaron McCauley’s 50 tackles. In spite of its injuries the Notre Dame Fighting Irish will sink the Navy Battleship with its hardnosed defense and ground and pound attack. The Irish will add to its dominance over the Navy Midshipmen rasing its all-time record against the Midshipmen to 72-11-1. Notre Dame 31, Navy 17.